The U.A.E. lies on the southern shore of the Arabian Gulf lies directly on the tropic of Cancer. 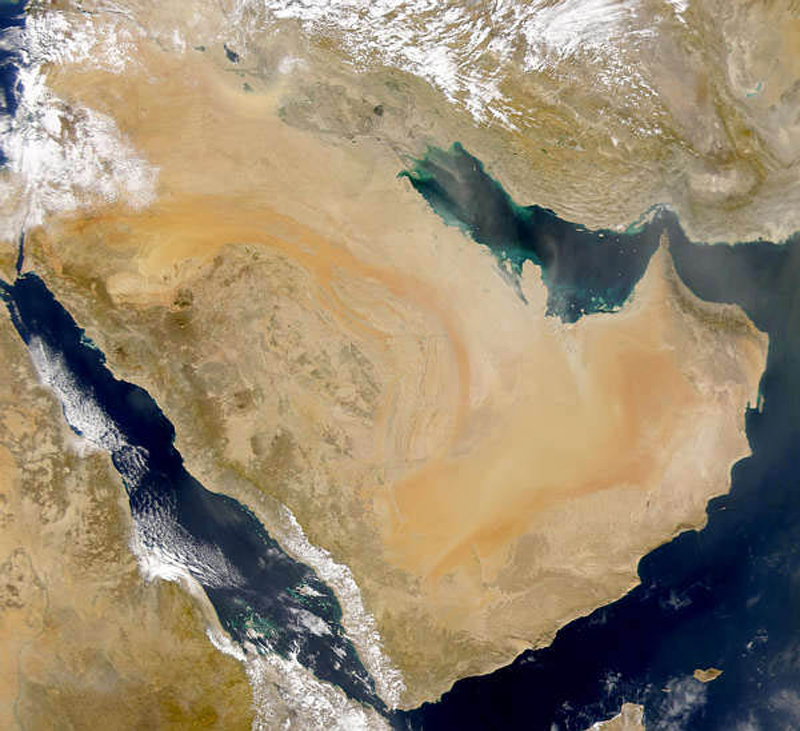 The Arabian Gulf it is surrounded by land, and has an arid, sub tropical climate that is continental in character and consequently has marked seasonal fluctuations in temperature (Purser and Seibold, 1973). This, coupled with the narrow Straits of Hormuz inhibiting the exchange of marine water, creates conditions in which the local sea water temperature and salinity vary widely. The air temperatures in the summer commonly reach 45 50°C, or in the winter may be as low as 0°C (Purser and Seibold, 1973). 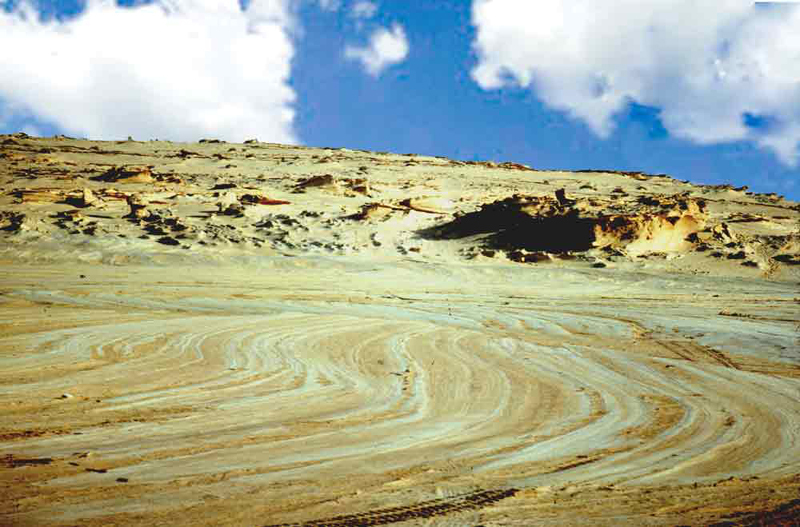 The combined effect of strong winds, high temperature and low rainfall results in significant evaporation and high salinities (Purser and Seibold, 1973) and the precipitation of the evaporite minerals gypsum and anhydrite in the coastal sabkha settings accompanied by a lack of natural vegetation in these regions. Winds blow dominantly from the northwest throughout the year (Kinsman, 1964) and this continuously drives the dews and associated humid air landward. The strongest winds are the northwest gale force "shamals" which occur during the winter. When these winds coincide with spring tides they cause flooding of large parts of the coastal plain. 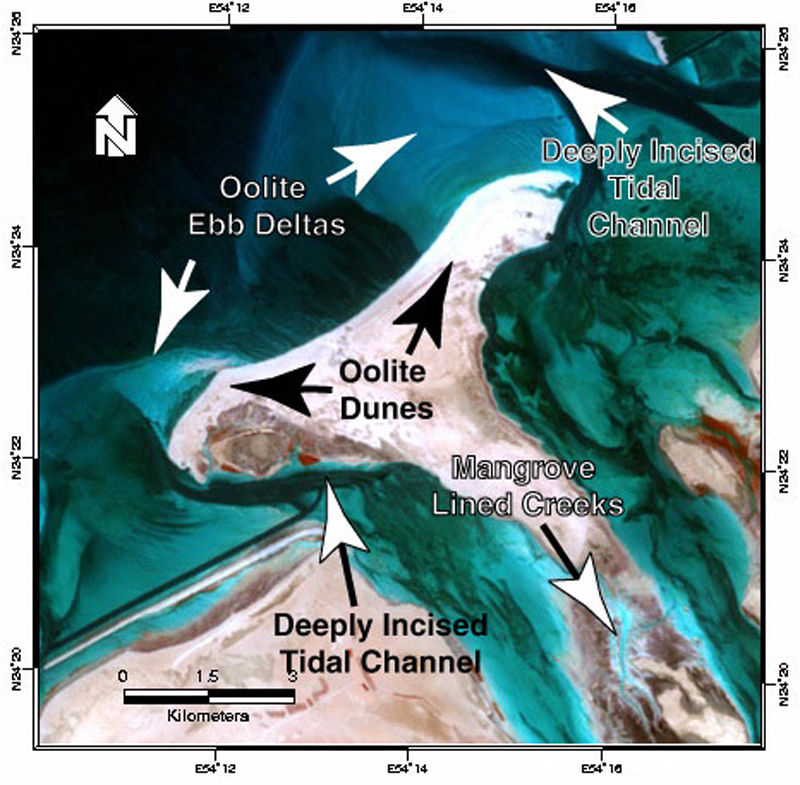 As with the hurricanes of the Caribbean and Florida (Pray, 1966), the shamals carry sediment landward from the frontal edges of the carbonate coastal shoals onto the supratidal flat, breaching and flattening coastal dunes and uprooting the vegetation that colonize them; they also initiate intertidal spits and beach ridges at the top of the intertidal flat on which the coastal dunes develop. This dominant wind direction has been constant through the Holocene and Quaternary, and the Pleistocene "miliolite" dunes exhibit a cross bedding that invariably dips southeast. The average rainfall of the U.A.E. is less than 50 mm (Evans et al, 1969) and consequently vegetation is restricted. Rainfall recorded at Tarif from 1958 to 1964 is shown in Table 1. These rains fall in autumn, winter or spring. Although infrequent, they may be torrential. The rain locally has a short term effect on the vegetation but although producing ephemeral changes in the evaporite mineralogy, this has little effect on the sediments and groundwater (Butler, 1965). 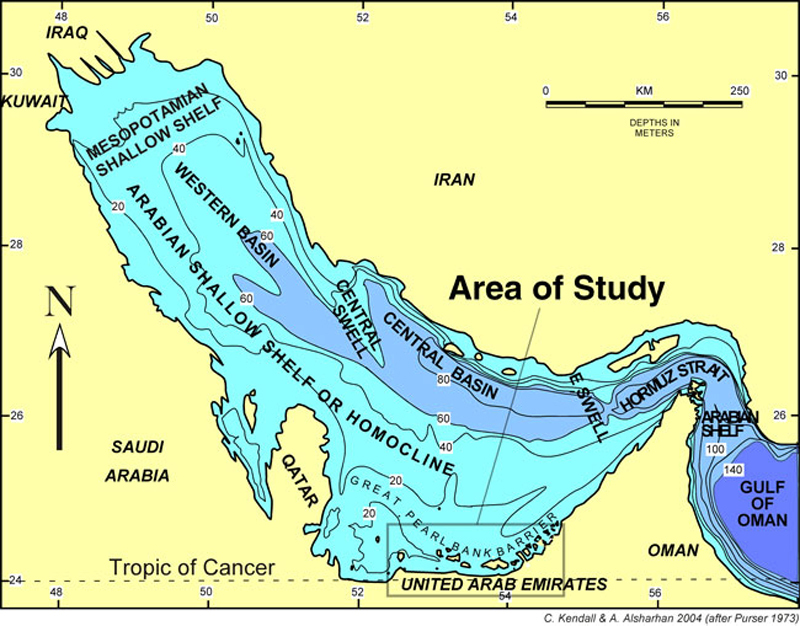 Fluvial input is low in the Arabian Gulf and is mainly confined to the Iranian side of the Gulf where the Zagros Mountains are a source of alluvial sediments. Fluvial input is significant at the Shatt al Arab where most of the fluvial sediment load accumulates in the marshes of Iraq (Berry et al., 1970). 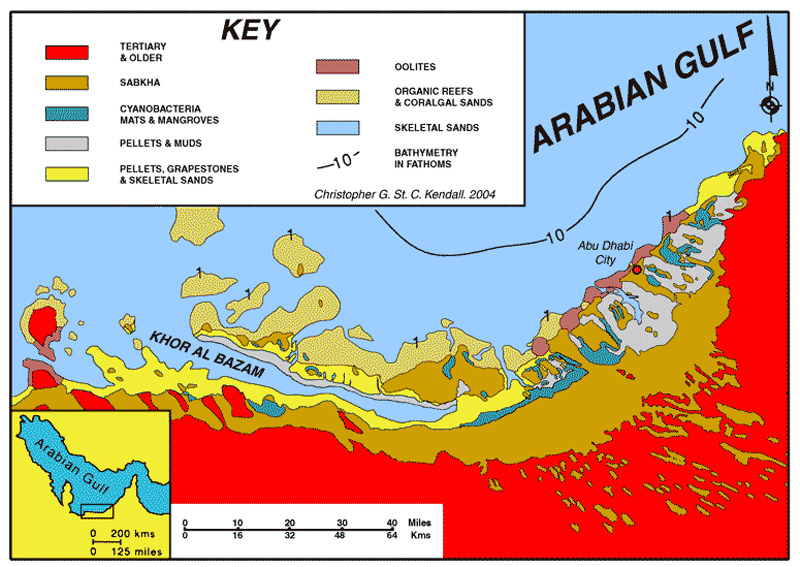 On the Arabian side of the Gulf, fluvial input does not occur, so the depositional setting favors little vegitation and the accumulation of almost pure carbonate (Purser and Seibold, 1973). Evaporation rates in the southern Arabian Gulf were estimated by Privett (1959) to be as much as 124 cm per annum. 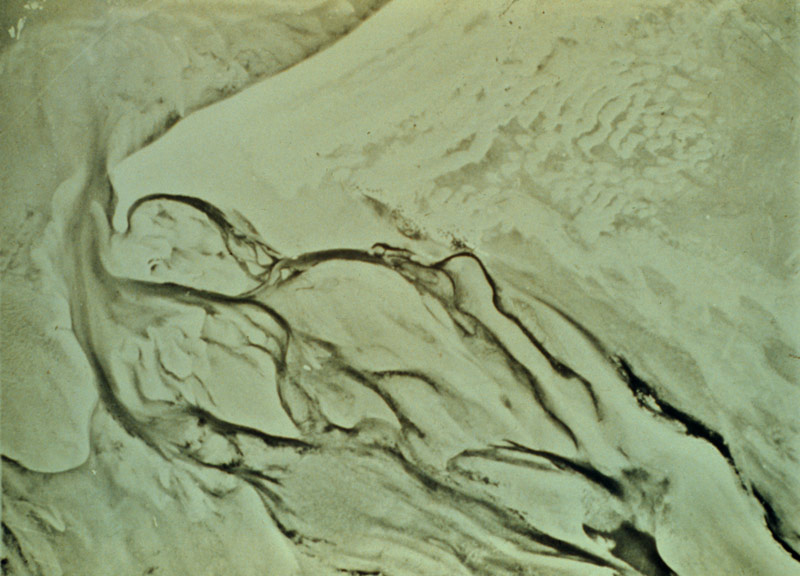 High summer salinities recorded by Sugden (1963) for part of the southern Gulf suggest that evaporation is greatest in summer, especially in restricted lagoons. 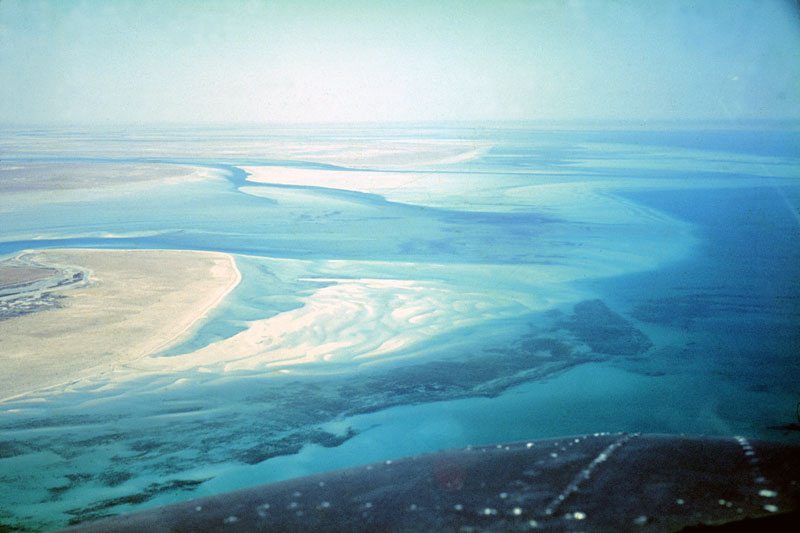 Brines collected by Butler (1965) from the ground waters of the sabkha both before and after storm induced marine flooding showed no appreciable difference in the concentrations of the various salts. There was, however, some effect on the evaporites. 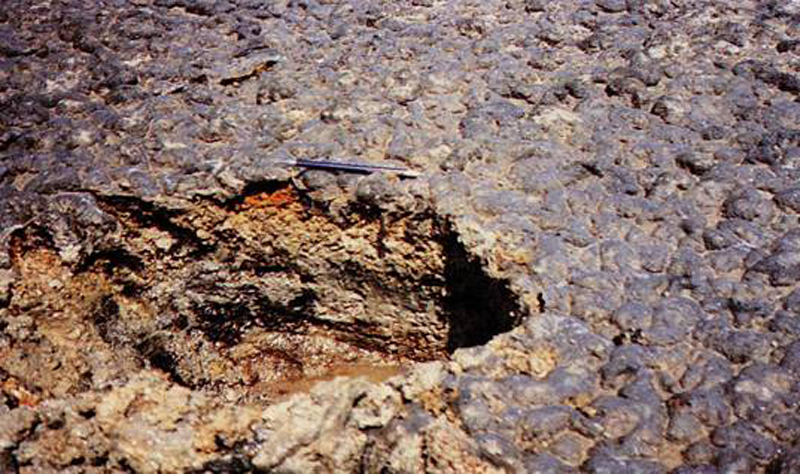 halite was washed from the surface sediments, while anhydrite on the surface above the intertidal zone was eroded. From the above description it is clear, with the exception of diurnal dew, the climate and surface hydrology does not favor the growth of lush vegetation. 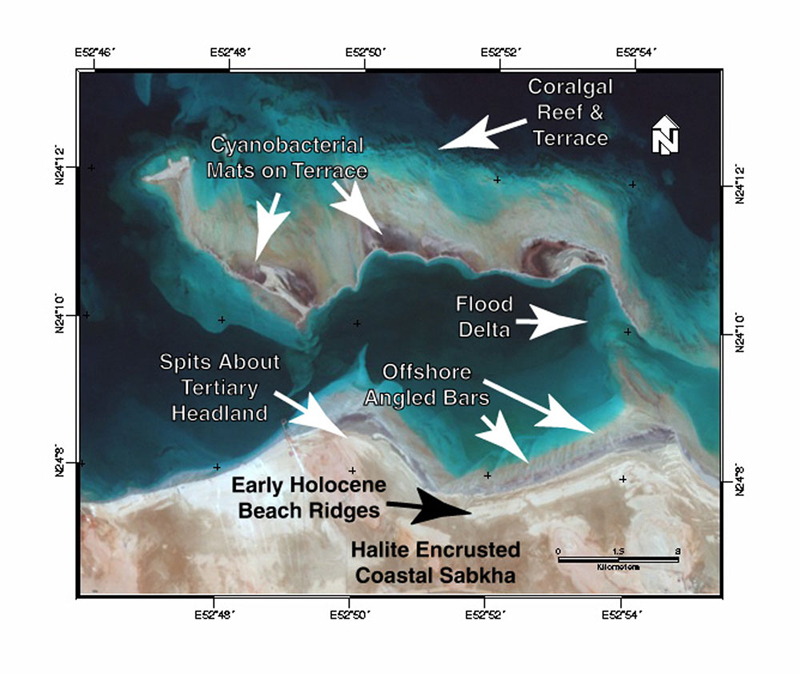 Subaerial dunes greater than 5 m. in height adjacent to steep beach faces and berms associated with the higher energy conditions north of the barrier islands of Sadiyat, Abu Dhabi and Halat al Barani. 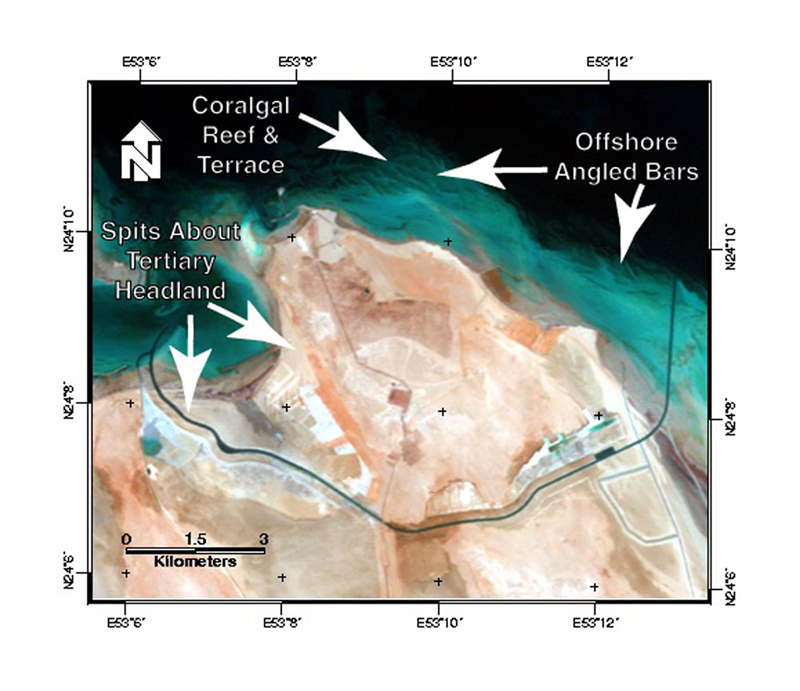 Sediments feed these beaches and dunes from an adjacent narrow shelf which is subject to sporadically heavy seas when the shamal winds blow. The dunes are in turn fixed by Salicornia sp. However if these dunes are traced landward the vegetational cover gradually disappears within a few hundred meters. 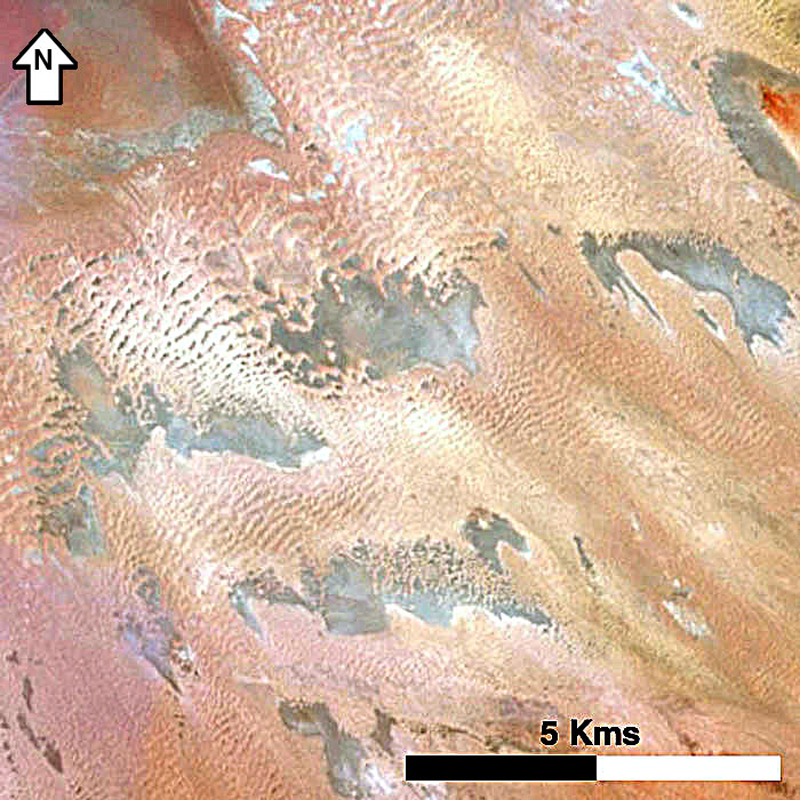 Small subaerial dunes, 1 to 2 m. in height landward of the small beach ridges of the exposed coasts of western Khor al Bazam which are common at the landward edge of the intertidal platform. As with the large dunes, these small dunes are commonly fixed in place by Salicornia sp. and as in the case of the larger dunes associated with the barrier islands their vegetational cover gradually disappears within a few hundred meters. 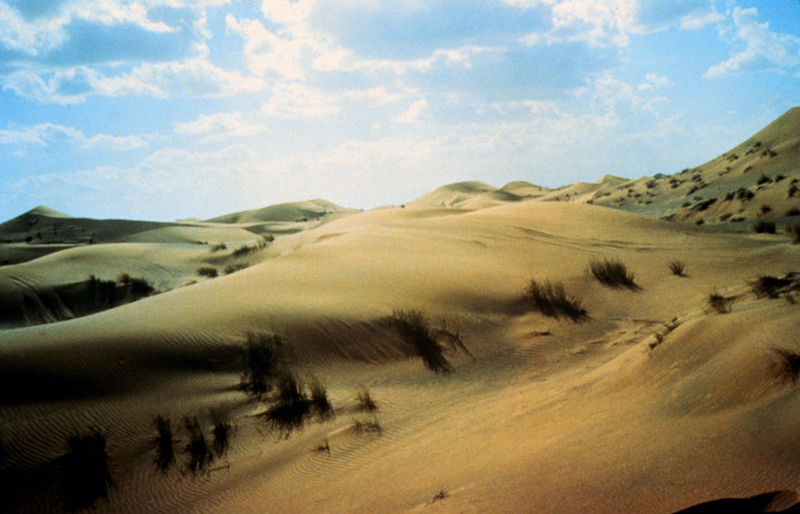 The pattern of vegetation cover reflects the local microclimate coinciding with the distribution of the diurnal dews associated with moisture brought inland from the humid Arabian Gulf by the late afternoon and evening onshore winds described earlier (Kendall and Skipwith, 1969; and Ministry of Water, Oman 1995). 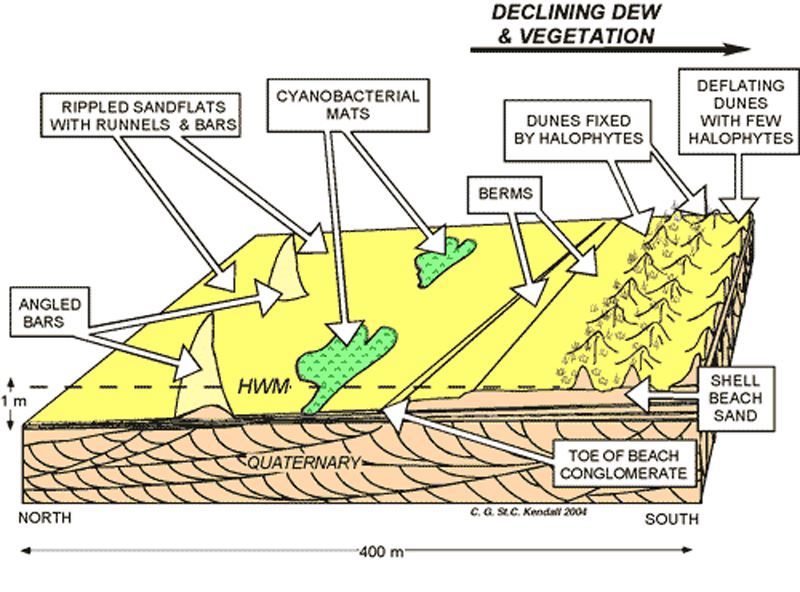 The dews lose their intensity and eventually disappear landward across the dune belt, and this decrease in precipitation is matched by a loss of the vegetation cover found close to the coast. The result is that the vegetation dies as the coast progrades seaward and the microclimate changes. As suggested by Patterson and Kinsman (1981), and Kirkham (1997), the evolution of the U.A.E. Coast began some 4000 to 3000 BP. 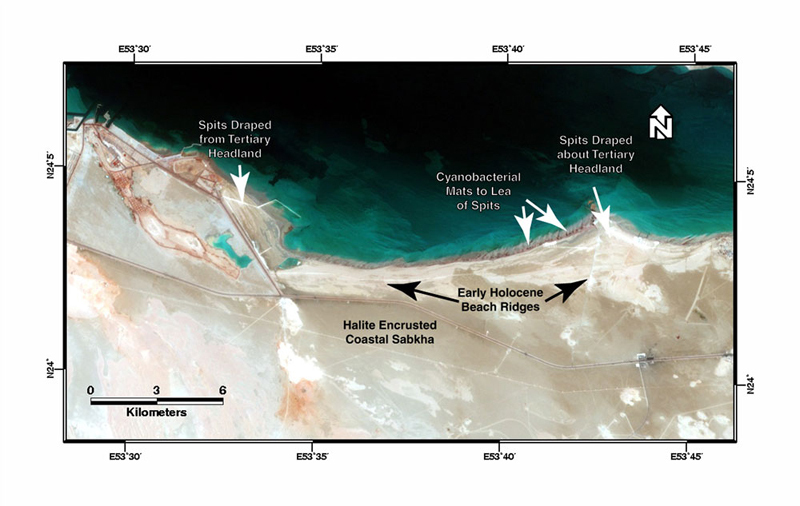 Tracing the evolution of the area south of Sadiyat, AbuDhabi, Halat al Bahraini, and Abu Al Abyad the lagoons appear to have been deeper and consequently the wave energy expended in them was greater than today. 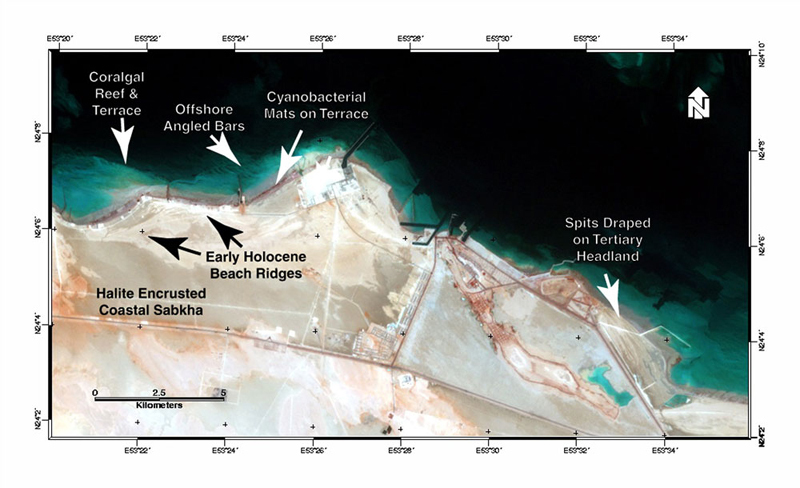 The coastal sabkha is rimmed by un vegetated stranded beach ridges which have a relief of about a meter above sabkha and often occur landward of the algal flats and their associated evaporates. 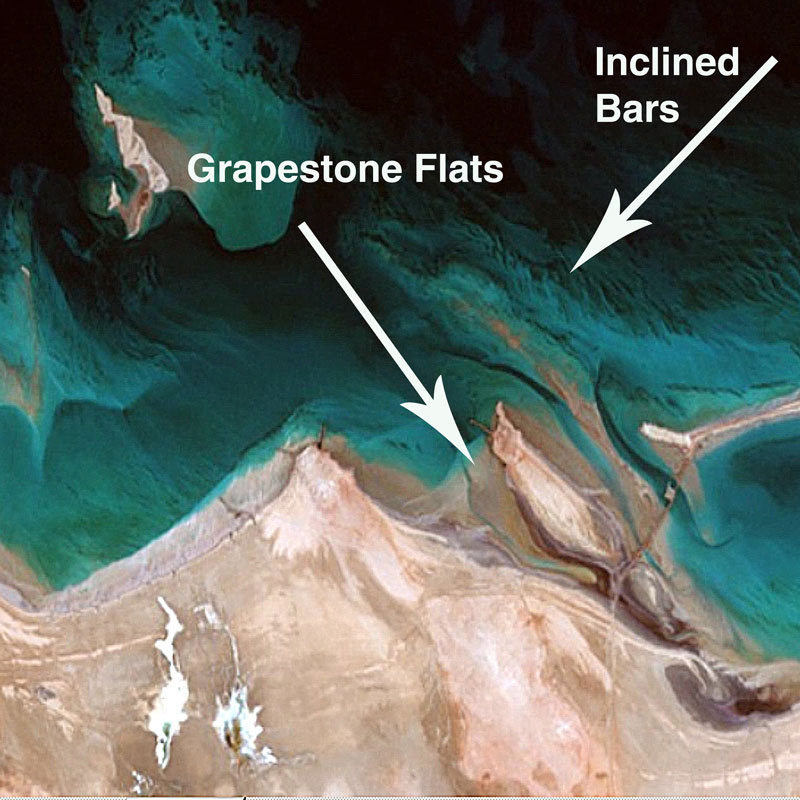 These beach ridges developed during the early stages of the Holocene, when the western U.A.E. 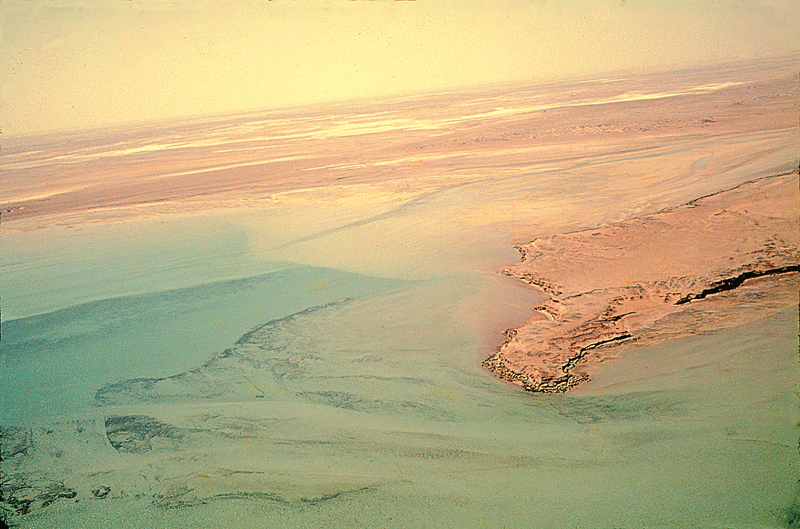 area of the Khor Al Bazam and portions of the lagoons to the lea of Abu Dhabi island were actually open bodies of water, subject to higher wave energies than today. 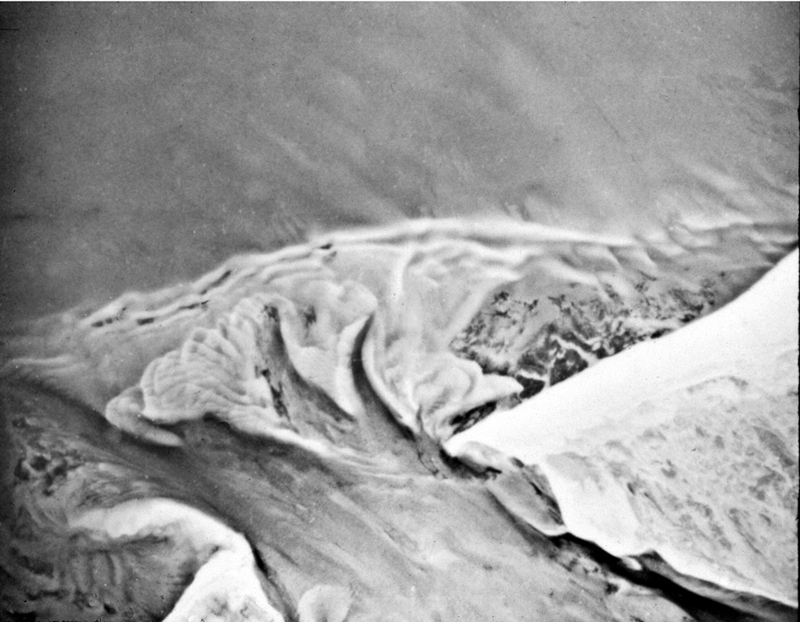 The result is that chenier like beach ridges formed of cerithid gastropod debris lined the coasts some 3000 4000 years BP (Patterson and Kinsman 1981, Kendall and Skipwith 1968 and Kirkham 1997). Subsequently, the lagoon margins filled, shallowed, became more restricted, and the beach ridges ceased to develop. On the protected coasts of the inner lagoons, intertidal algal mats began to form while shallow offshore just subtidal sands or muds accumulated. 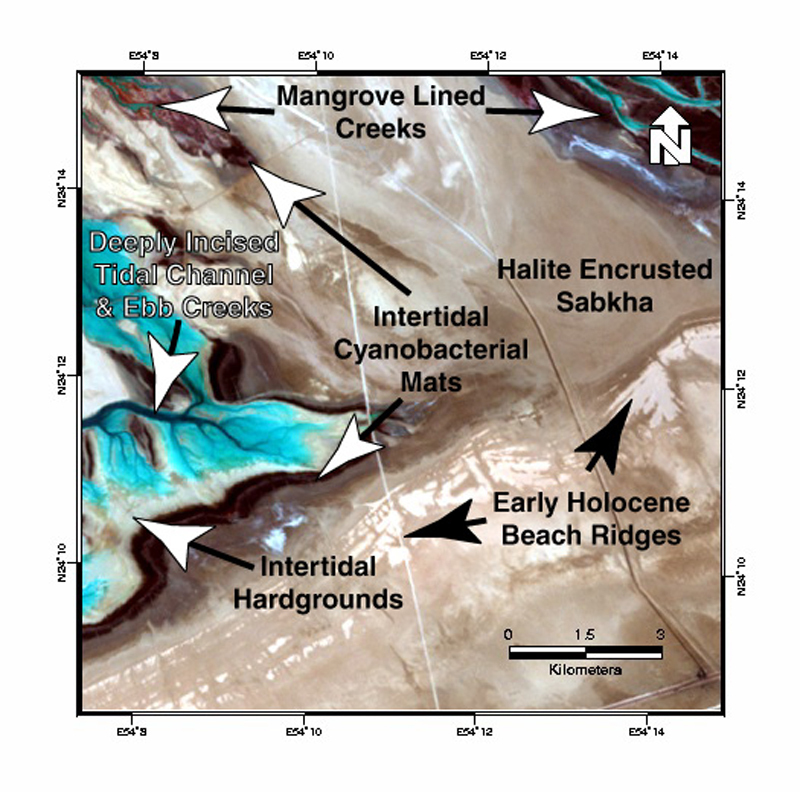 These algal stromatolites and their associated evaporite cover have prograded five to six kilometers seaward encroaching on the inner coastal lagoons since 3000 4000BP. 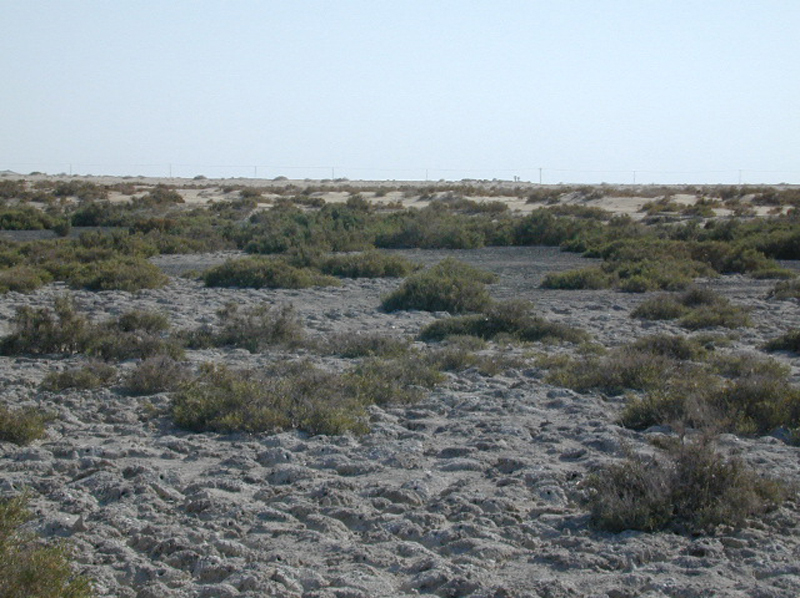 In the Khor al Bazam, halophytes like Arthrocnemum glaucum line the shore in areas above the high water mark and on intertidal spits. They trap sand blown off the beach at low tide and help to stabilize coastal dunes. Despite low rainfall, the plants survive on heavy nightly dews and moisture retained in the beach sediments by seaweed humus. Adjacent and parallel to the beach, foredunes form mounds of up to 2.5 m high; behind them there may be one or two beach ridges. Approximately 30 m from the shore the dunes begin to lose plant cover, probably because the amount of dew precipitated on the plants decreases rapidly with increasing distance from the sea. Without the plant cover, the dunes are blown away, leaving behind beach ridges. 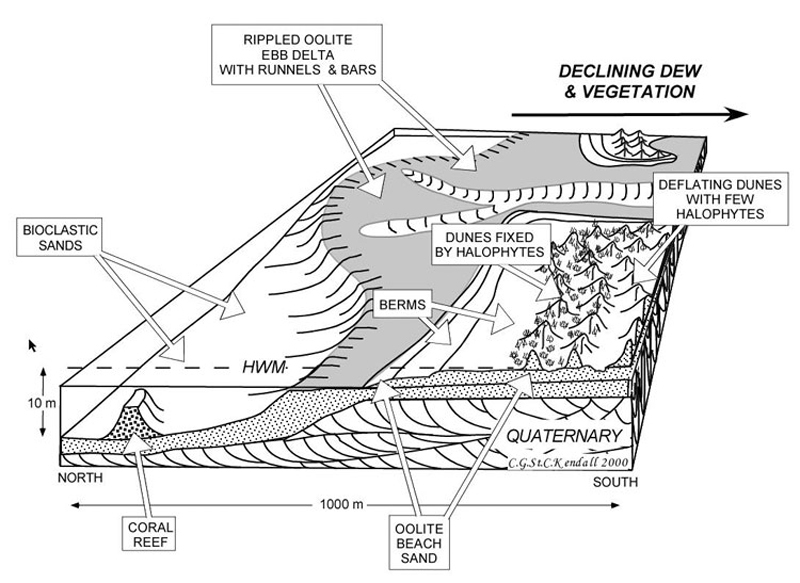 On the basis of the current occurrence of vegetation on the coastal dunes forming today and the lack of vegetation on earlier deflated beach ridges we predict that as the coast continues to prograde the coastal dunes developed on this coast will develop a vegetation cover while the older dunes will lose the cover and deflate, reflecting the concurrent local decline of dew precipitation on the stranded beach lines. 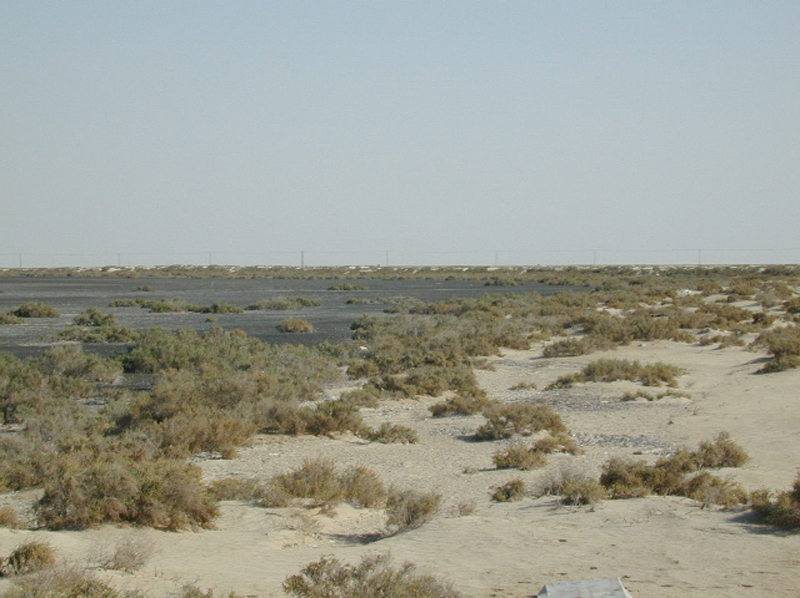 The current system of coastal lagoons in the U.A.E. will eventually fill through the natural accumulation of sediments and/or by man driven reclamation. As this fill takes place so this will cause the demise of current halophyte cover of coastal dunes while new dunes will develop with new vegetation. This inter relationship demonstrates the interaction of paleobotany, and microclimate responding to evolving morphology of coast U.A.E. 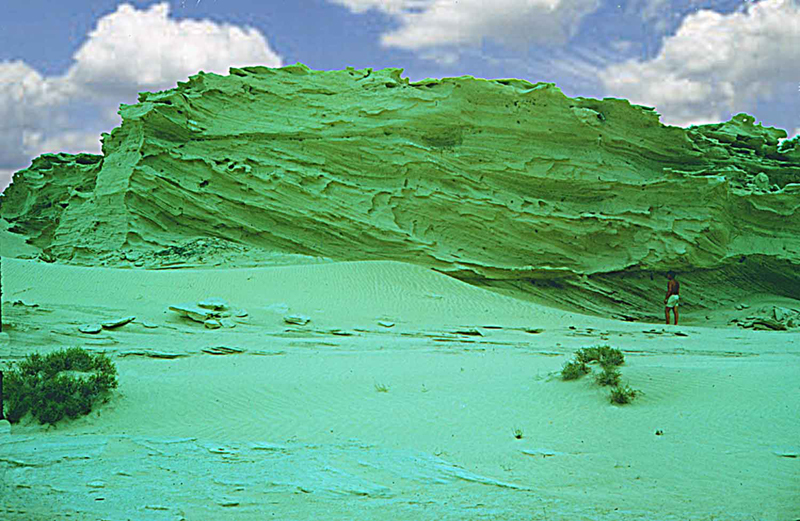 gypsum coastal dunes are common to certain parts of the coasts of Abu Dhabi in the western U.A.E. including the islands of Marawah and Abu al Abyad on the bank north of the Khor al Bazam, and the west side of the Dhubaiya Peninsula. 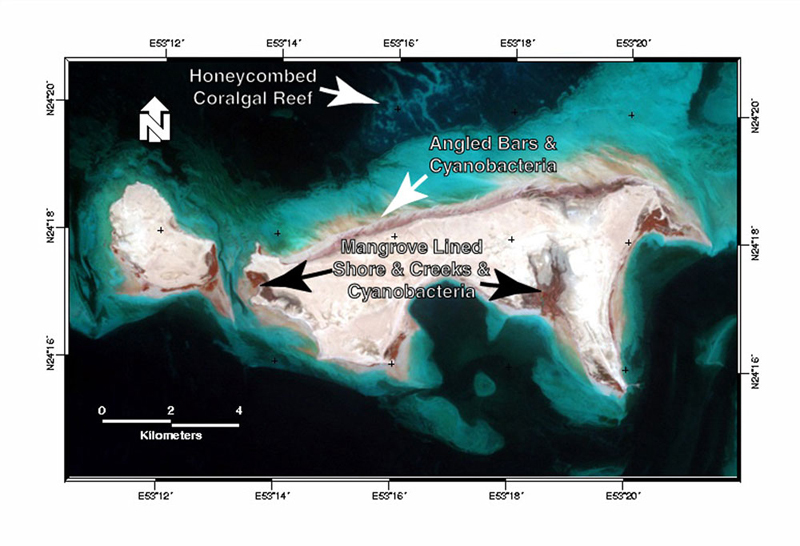 Pleistocene outcrops protect these areas from the effects of wave erosion and that tidal creeks develop are lined by mangrove stands and algal flats enclosed by small subaerial dunes of gypsum, 1 to 2 m. in height. As with the carbonate dunes, these gypsum dunes are commonly fixed in place by Salicornia sp. and as in the case of the carbonate dunes their vegetational cover gradually disappears within a few hundred meters. 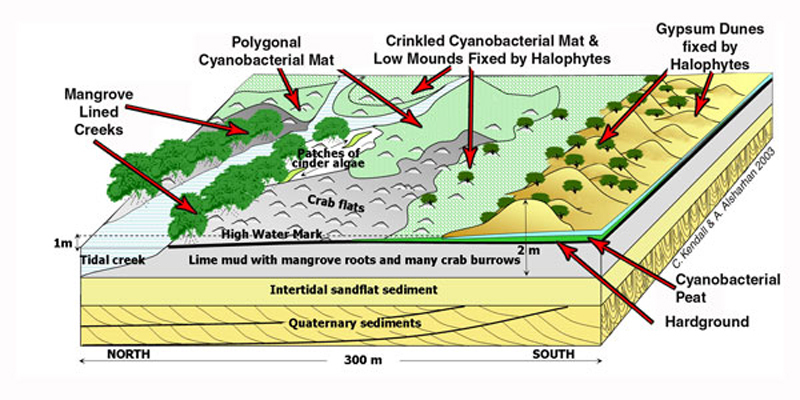 As these channels become filled with carbonate silt and the tidal flats prograde seaward, the area becomes more restricted and is colonized by cyanobacterial mat and the mangroves die. The cyanobacterial mats tend to grow landward of the mangroves though in the higher reaches of the creeks they start to grow on banks. 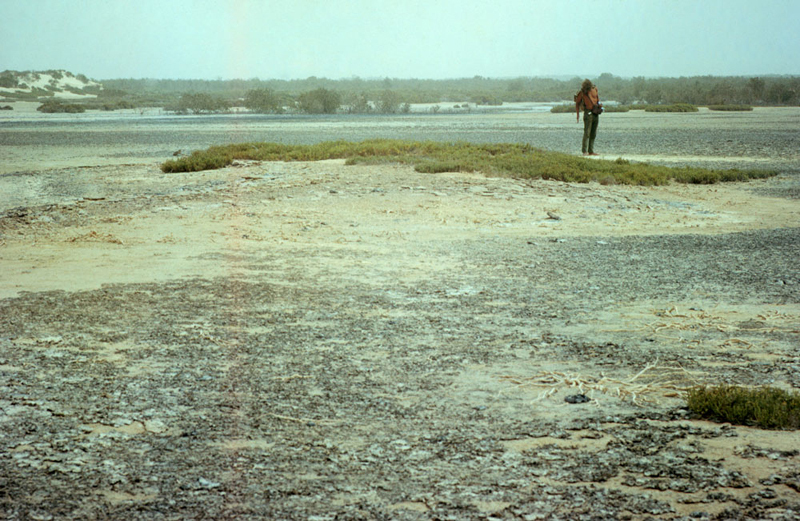 These flats are crenulated and cover gypsum that is deflated to form the dunes..
Again the pattern of vegetation cover reflects the local microclimate coinciding with the distribution of the diurnal dews associated with moisture brought inland from the humid Arabian Gulf by the late afternoon and evening onshore winds described earlier (Kendall and Skipwith, 1969; and Ministry of Water, Oman 1995). 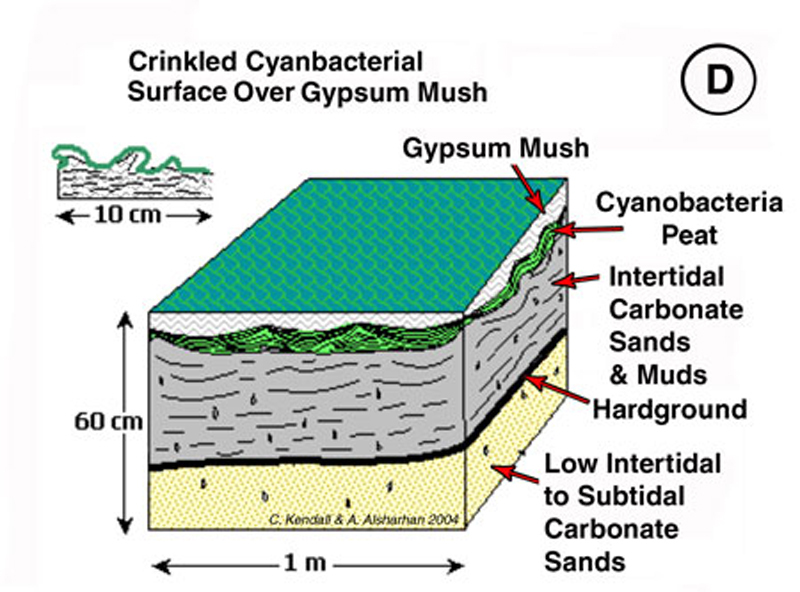 Inland, the algal mat may be marked by a superficial polygonal pattern while landward a crinkled cyanobacterial mat overlying a gypsum mush in turn supersedes this. This gypsum may be deflated from the cyanobacterial mat crinkle zone to form dunes covered by halophytes such as Arthrocnemum glaucum. These dunes can enclose the creek area. 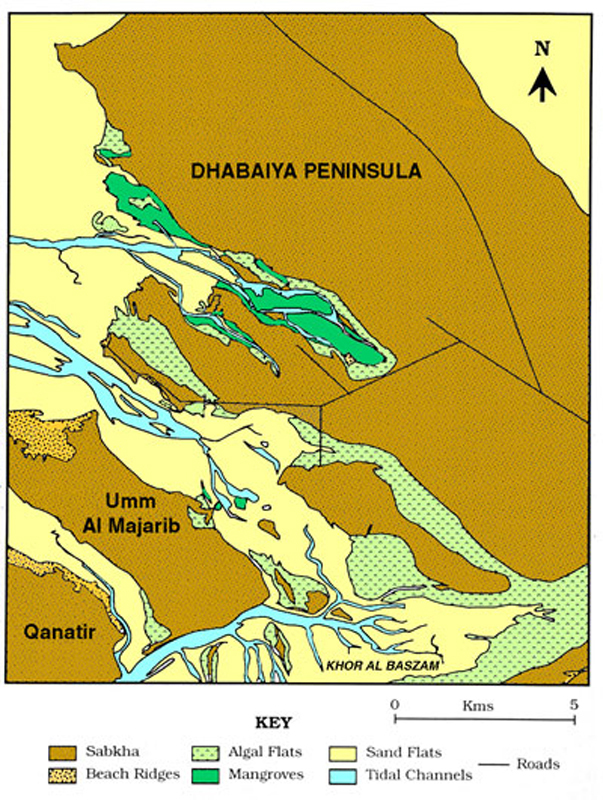 Thus in the vicinity of Dhabaiya and other locations the sabkha can be traversed into a gypsiferous crinkled algal flat, which in turn, passes into a burrowed crab flat with some Arthrocnemum glaucum colonizing local highs, and finally to mangroves lined the tidal creeks. Cementation can be observed in the form of hardgrounds around the Arthrocnemum glaucum and extending down into the burrowed crab flats. Mud cracked zones are common here.rites of this area. 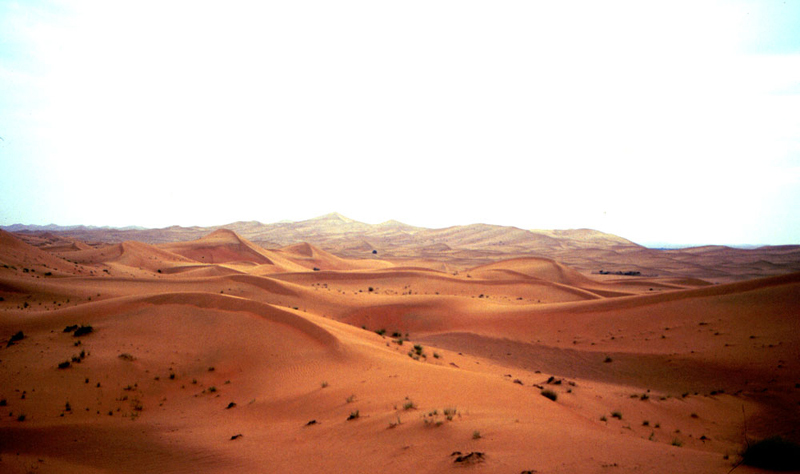 South of the coastal sabkhas of the UAE fields of Barchan dunes are interspersed with continental sabkhas flats. These dunes are largely composed of quartz but have enough carbonate sands mixed in them that they tend to have a whitened color reflecting this carbonate. 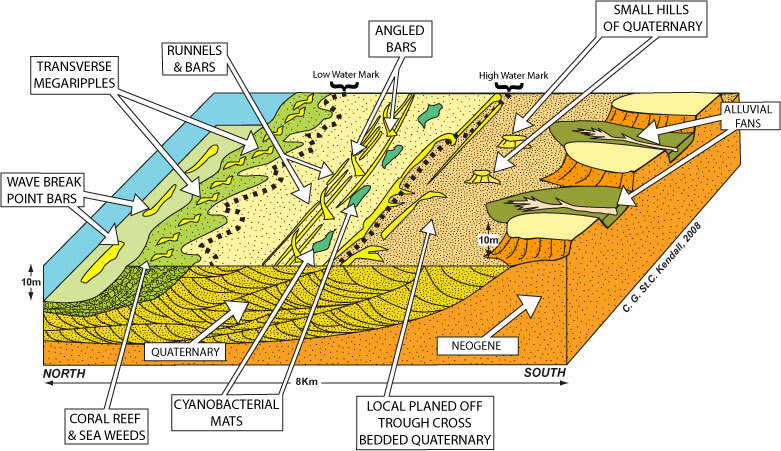 Tertiary and Quaternary rocks (miliolite) crop out close to the coast as low mesas and buttes surrounded by alluvial fans. These hills are remnants of a much more continuous cover of almost horizontal rock, eroded by the combined action of flash floods and wind (Kirkham, 1997). Where the miliolite projects as peninsulas into the sea, seawater, boring algae, and animal activity etch the rock surface, in the same way as the cay rock of the Bahamas (Newell et al., 1960). 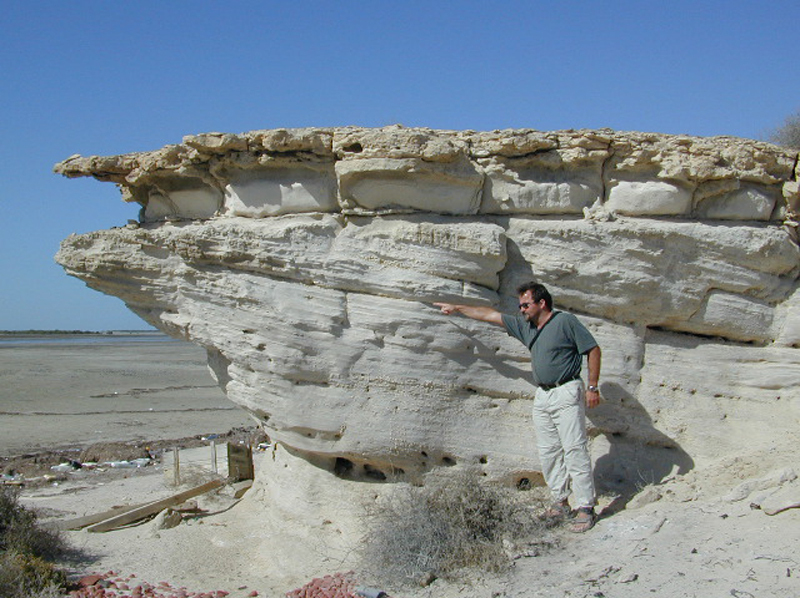 Commonly in inland areas, wind and marine flooding have eroded the miliolite flush with the water table of the surrounding sabkha (Kirkham, 1997). Interestingly locally the aeolianite is capped by a younger marine section rich in cerithids. 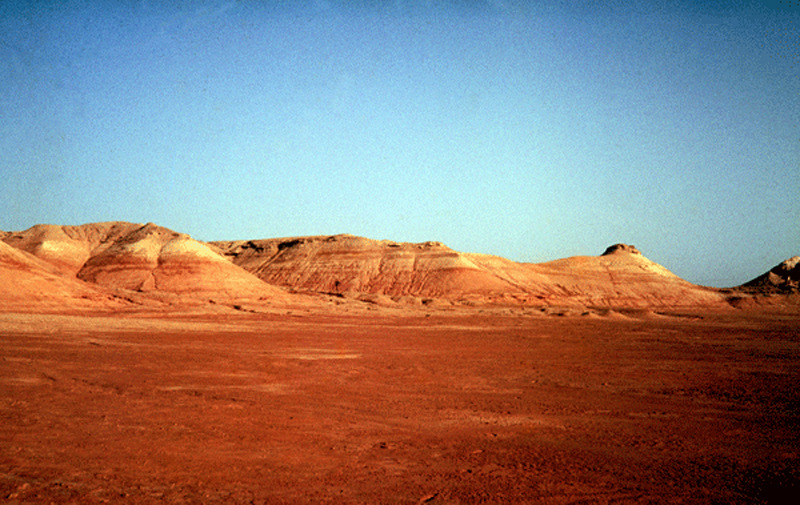 South of the coastal sabkhas the dune fields become more common and their color becomes redder. They form enormous waves of sand that parallel the coast and are capped by the barchan dunes of the Empty Quater or Rub al Khali.